Last weekend, we Bolt bussed it to Philadelphia especially for the Philly Craft Beer Fest at the Navy Yard. The festival was a little smaller than I’d hoped and we didn’t witness any Eliot Ness-style beer raids but we had a great time tasting brews from around 68 brewers and vendors. 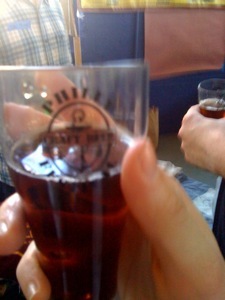 One of the highlights for me was seeing Cigar City handing out glasses of their best brews. I’d first discovered this brewery when I was home visiting family in Florida. Ever since, I’ve been seeing them everywhere — maybe they’re following me? There were many other breweries there as well. From small local guys like Lancaster to big players like Stone and even, inexplicably for most craft brew fans, Michelob showed up. We also had a great conversation with one of the representatives at Troegs. A.J. — your the best. Thanks for refilling our glasses … repeatedly. Anyhow, for a little extra peek at the festival, check out my pics after the jump. 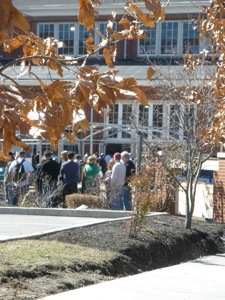 The line was very long and reached out from the front door, circling around a few times. As we got on the end of the line, we were not thrilled to be waiting. But the line moved pretty fast for having such a huge mass of people. It was also a pretty chill line. No one fought, no one yelled, no one even really got angry. 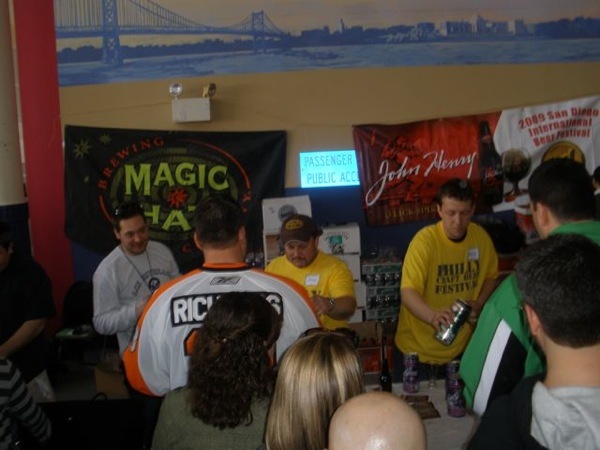 It was just a group of people joined by the brother/sisterhood of beer and the anticipation of a huge variety of brews. And we’d been promised some great brews as well. We were looking forward to getting in the door and jumping on line to drink that first beer of the day. Our session started at 12:30 p.m. (we got in the door closer to 1:00) and we were ready to take on some great day-time drinking. 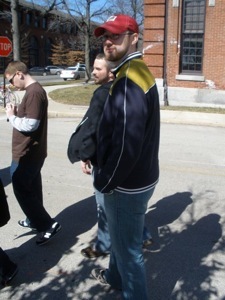 It’s also interesting to note the great array of people you’ll find waiting in line for a beer festival. While the vast majority are certainly men, the craft brew culture is beginning to embrace women in great numbers as well. MadHops doesn’t always enjoy waiting in line but with such great company, how can you be sad? We had met some friends in town for breakfast before heading all the way south for the festival. We grabbed lunch at a cute little diner in the Reading Terminal (foregoing the scrapple, thank you very much) and prepped ourselves to sip nectar from some of the best breweries across the country. Of course, we were anxious to get inside but we were happy to wait just a few minutes for the promise of beer. 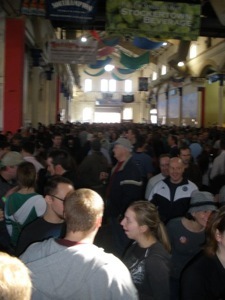 We finally got inside and got right back into the hundreds of lines forming in front of brewers’ tables. But we had a strategy: head all the way to the back of the room and work your way up. And when we got back there, we found brewers like Magic Hat who were more than happy to let us taste their Spring seasonal and Circus Boy. 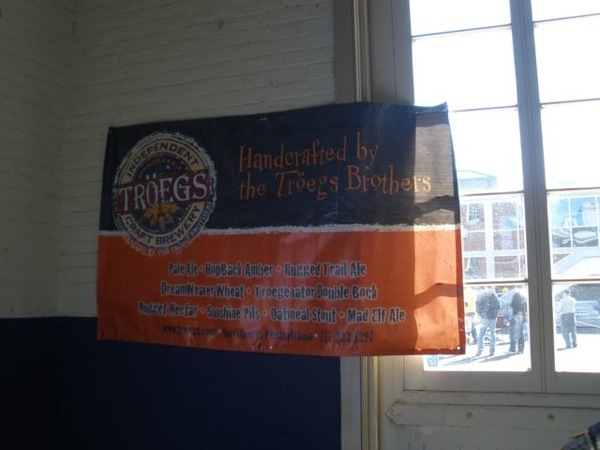 We also found Troegs way in the back corner. And we made friends with them. The guys behind the taps were very patient with us and, more often than not, excited to discuss the beer they were pouring. 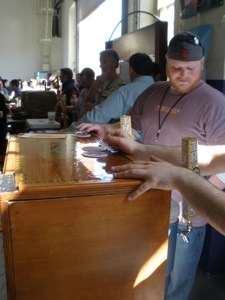 There were only a few tables where you found volunteers who weren’t necessarily familiar with the brews they served. But, no matter what they knew about beer, they were pretty much always all-around good people. And I have to imagine that dealing with the crowds that they had to deal with, they must have been awfully patient people as well. 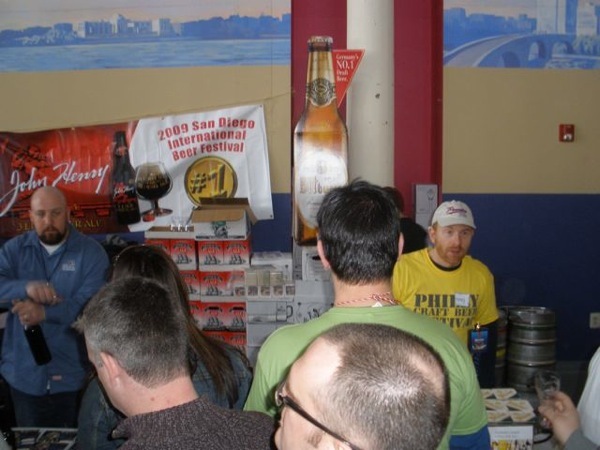 A glance over the crowd and you’ll probably notice that not everyone was there purely for craft beer. Some of them were just there to get boozed up on beer with their buddies. Perhaps that $75 ticket they bought was just an excuse to day drink or maybe they didn’t even pay for the ticket (I overheard some speculation that people had printed duplicate tickets and gotten in with them). As a result, the crowd was not purely dedicated to quality beer and that made some of our fellow festival goers kind of annoying and I’m sure it was even more difficult for the pourers to deal with. The space was not huge so we weren’t really surprised when it filled up really quickly. After about an hour, the space got so packed that it was difficult to navigate through the halls. Lucky for us, the festival featured an outdoor space and the weather was beautiful last Saturday so we spent quite a bit of time hanging around the outdoor brewers’ tables. Some vendors had also set up some outdoor games at which many a drunken festival goer tried his or her hand. One of them involved kicking a soccer ball into a target which was just mean to do to those who’d been drinking for most of the day. The port-o-potties were also located near these outdoor tables (not too close but they were in the general vicinity). There are very few situations where women and even some men can be convinced to use a smelly port-o-potty but believe me when I say that at this festival, no one was being shy about standing in line for those things. Let’s face it, eventually you’ve got to break the seal at some point. And then I got to meet the tallest leprechaun ever. We chatted about our shared Irish history. (Not so much chatted as we both said, “Hey, I’m Irish. Cool. Let’s take a picture.”) Then he went about his merry way. 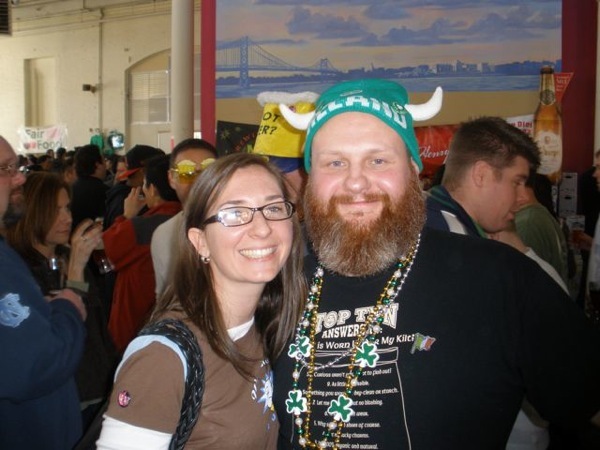 While we had a great time at the festival and in Philadelphia, I think I’m going to have to go back for Philly Beer Week in June to truly get my fill. Yes, that’s exactly how I felt! It was fun but just a little too crowded for the number of brewers. We’ll definitely be going for the one in June, so hopefully it’s as good as I’ve been saying!